The BBC recently named Lana Abu-Hijleh, 85BSE, one of the "100 Most Inspiring Women in the World," alongside the likes of Oscar-winning actress Hilary Swank and Muzzon al-Mellehan, a refugee education advocate known as the "Malala of Syria." A dedicated community builder, Abu-Hijleh has spent the past 30 years leading development and humanitarian work for the people of Palestine–work motivated by the loss of her own mother in the Israeli-Palestinian conflict. 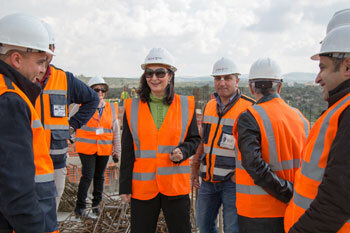 Abu-Hijleh began her career in 1986 as the United Nations Development Program (UNDP)'s first engineer in Palestine. Overcoming age and gender discrimination, Abu-Hijleh constructed the Jabalia Refugee Camp Sewage Collection and Treatment System in the Gaza Strip and rose to become one of the UNDP's most senior national staff. Since 2003, Abu-Hijleh has served as West Bank/Gaza Country Director for Global Communities. Through the international development nonprofit, she oversees a team of 200 people who seek to improve social and economic conditions through programs that build local infrastructure and empower women and youth. Also once appearing on Forbes magazine's 100 most influential Arab women in the Middle East, Abu-Hijleh says: "As long as my country needs me, I will be here." How does she help address the challenges of life in Palestine? Throughout her career, Abu-Hijleh has helped build schools, hospitals, community centers, and housing projects; reconstructed homes destroyed by war; improved water systems and other services to Palestinian towns; and worked to preserve her cultural heritage. She's also the first Palestinian woman on the board of directors for the Palestine Investment Fund and the Bank of Palestine. But Abu-Hijleh says she's most passionate about encouraging youth and women to be involved in civic life, hoping to inspire others to one day follow her example. What's her family connection to Iowa? Abu-Hijleh's uncle once worked as a surgeon at the UI Hospitals and Clinics, so she was familiar with Iowa City. Still, she says her parents showed great courage in sending a 17-year-old Palestinian girl halfway around the world for a college education. Abu-Hijleh's brothers–Rami, 94BSE, 99MS, 09MBA; Raed, 91BSE; and Saed, 91BS–followed her to the UI, where she was impressed with student involvement in global humanitarian causes. After her UI graduation in 1985, she immediately returned to Palestine to use her civil engineering training to serve the community. Says Abu-Hijleh: "I'm proud that I have a career that focuses on building when everything around me is so much about destruction. I not only build physical things, but also good lives, good character, good futures, and hopefully, a better world."